Hooray! We made it to post number two! Alright, so since I just posted about three months of work under the "House Tour" page, I thought I'd spend some time breaking down all of that work, room by room. We thought we'd start with the room we spend the most time in- the living room! Our living room is the first room you walk into from the front door, so of course we want the room to be welcoming and inviting. You know, a "stop and stay awhile" kind of vibe! As you can see from the "before" picture below, the walls were a completely blank slate. The mantel was painted an out-of-place bright white while the rest of the fireplace and walls were painted a blah neutral. These walls looked jailhouse stark! I knew that we just HAD to bring some contrast to these blank walls. 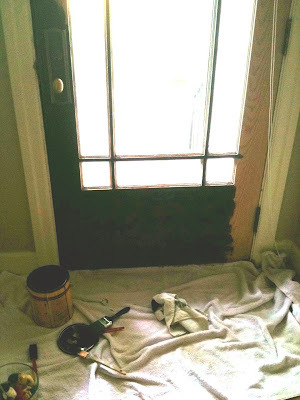 Soooo, we painted the trim, crown molding, and fireplace an off-white creamy gloss (for ease, we used the color that is currently the color of the trim and crown molding all over our house- a custom Porter paint color). Voila, high contrast. Much easier on the eyes, right? Again, staining the front door brought more high contrast with the very neutral walls. In my opinion, contrast is the best way to keep a room looking clean and crisp. yeah , Amazingly great interior work !!... Checked out the entire project and must say I Loved the colour on the walls, white trims and DIY artwork ... Wishing you all the very best ! !